FREE* return economy class airfare from Sydney, Brisbane or Melbourne to Guayaquil (Equador) inc tax. 1 night pre-cruise accommodation in Guayaquil at the Hotel Hilton Colon with breakfast. Transfer from Guayaquil hotel to airport. Charter flight from Guayaquil to the Galapagos. Transfer from Galapagos airport to port. 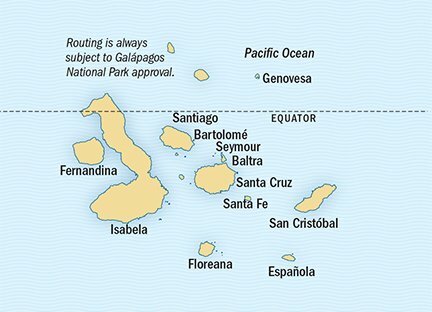 7 night expedition cruise aboard the National Geographic Endeavour II ship to the Galapagos Islands. All shipboard meals and non-alcoholic beverages. Your bar tab and WiFi** are included in the voyage price (note: certain super-premium brands are not included). Onboard ship cappuccinos, lattes & filtered water. Hors d`oeuvres & snacks during recap onboard ship. The guidance and company of the Lindblad expedition staff. Sightseeing & entrance fees along with special access permits, park fees, port taxes. All shore excursions, zodiac & kayak explorations. Snorkeling (including wetsuits, masks, fins & snorkels). Lectures and presentations onboard ship. Transfer from port to airport, Galapagos. Charter flight from Galapagos to Guayaquil. Transfer from Guayaquil airport to hotel. 1 night post-cruise accommodation in Guayaquil at the Hotel Hilton Colon with breakfast. DAY 1 - Fly FREE Sydney, Brisbane or Melbourne to Guayaquil. DAY 1 - Arrive Guayaquil, own way to hotel*. DAY 1 - Guayaquil, Equador. DAY 2 - Galapagos Islands, Ecuador. DAY 4 - Santa Cruz Island, Galapagos. DAY 5 - Isla Isabela, Galapagos Island. DAY 6 - Isla Fernandina, Galapagos Island. DAY 7 - Floreana Island, Ecuador. DAY 8 - Espanola Island (Punta Suarez), Galapagos Islands. DAY 9 - Galapagos Islands, Ecuador. DAY 9 - Guayaquil, Equador. DAY 10 - Guayaquil, Equador. DAY 11 -Own way to airport*, Fly FREE Guayaquil to Australia. DAY 13 -Arrive Sydney, Brisbane or Melbourne. Twin View Upper Deck - From $9,120pp. Twin View Lounge Deck - From $11,990pp. Twin View Bridge Deck - From $13,450pp. Single View Upper Deck - From $13,620pp. *Conditions Apply. All prices shown here are per person share twin (unless stated as single) in AUD, based on best available cruise fare at time of publication (18Feb19). Offer valid until 31st July 2019 or until sold out. Departure Dates include 09 Aug, 23 Aug, 30 Aug, 04 Oct, 11 Oct, 18 Oct, 25 Oct, 01 Nov & 08 Nov 2019. Some cabins may have obstructed views. All prices based on cash payment - credit card fees may apply. Cruise deposit, amendment and cancellation conditions apply. Travel agent service fees may apply. Special conditions apply - please ask for full details at time of enquiry. All passports, vaccinations and visas are the responsibility of the travelling guest to secure prior to departure from Australia. Free airfare based on a set budget and once flight costs exceed budget, a surcharge may apply. Transfer from international flights to Guayaquil hotel is operated as a complimentary airport shuttle service by hotel and is guests responsibility to book with hotel prior to departure. We reserve the right to correct errors without penalty. Offer ends 31Jul19 or until sold out/withdrawn and is subject to availability at time of booking. Travel insurance is mandatory, but not included.